Mrs. Buresh has been teaching at Spring Brook for several years and previously taught at Builta and White Eagle. Originally from Naperville, Mrs. Buresh has a Bachelor’s Degree from North Central College and a Reading Specialist Degree from Olivet Nazarene University. Her favorite part of teaching is helping students learn to love reading and is a passionate reader herself. In her free time, Mrs. Buresh enjoys spending time with her sons, Andrew and Finn, and husband while vacationing in Disney World, watching movies, and just hanging around. Mrs. Verdun has been teaching since 1990. She has taught kindergarten, 3rd grade, 4th grade, and 5th grade. She earned her undergraduate degree from Eastern Illinois University and her master's degree from Northern Illinois University. She has lived in Naperville most of her life and is a graduate of Naperville Central High School. In her free time, she likes to spend time with her family, listen to music, travel, and read. Mrs. Zielinski has been teaching since 2012 and had the opportunity to teach 4th and 3rd grade throughout the country. She grew up in Naperville, and attended Elmhurst College. Mrs. Zielinski then student taught at Spring Brook. Six months later, she moved to Los Angeles, California where she taught fourth grade for 4 years. Her and her husband relocated back to Naperville in the summer of 2018. Mrs. Zielinski is a passionate teacher that loves to see every student reach their full potential. In her free time, she enjoys watching movies, dancing, theater, crafting, reading, and being creative. Mrs. Zielinski looks forward to being a part of the Spring Brook family. Language Arts is composed of several interrelated areas: reading, writing, spelling, listening and speaking. The students are encouraged to learn to communicate clearly through these five areas. The writing program strongly focuses its basis from the 6 + 1 Trait Model. It is utilized for teaching and assessing writing. This model focuses on ideas, organization, word choice, sentence fluency, voice and conventions. Everyday Math allows students to construct an understanding of mathematics from their own experience and includes practical routines to build arithmetic skills. Important concepts or skills recur with variations. The concepts are introduced and revisited in a variety of formats which provide lots of practice. The focus is to have students recognize that there are various ways to accomplish a task and to find the best tools for solving a problem. Along with Everyday Math, the students participate in the Otter Creek Fact Program. This program teaches automaticity in fact skills on a daily basis. Third grade students start off the year in subtraction and move to multiplication by the second semester. The purpose of science is to provide students with relevant hands-on opportunities and experiences that help them to better understand science. Each unit is explored over a period of several weeks. We incorporate our science instruction with our reading skills by using leveled readers. 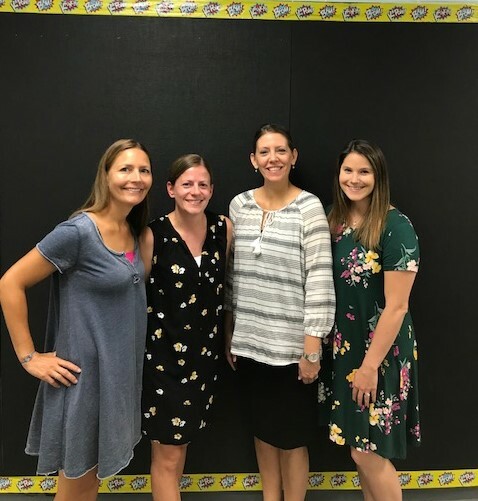 As we begin our new school year, the third grade team would like to take this time to share with you our classroom management plans. Our goals are to provide a positive learning environment for all students, for your child to feel valued, and to create a healthy learning community. We understand that this should be built with mutual respect between the teacher and the student. One way we will work towards building a positive learning environment is through daily base groups. These groups will allow the students to form connections with each other in a safe environment. We encourage you to discuss these meetings with your student. Each classroom has discussed what it takes for successful learning to occur. It is very important to have the cooperation and attention of the students. Our classroom management plan has been designed so that we can all be safe and so that we learn as much as possible. This is the plan we will be using, the rules are quite simple and easy to follow. 1. Be respectful! Be kind and courteous. Use quiet voices. 2. Be responsible! Follow directions. Give your best effort. 3. Be there...Be ready! Be on task. Be prepared. 4. Be safe! Keep hands, feet, and objects to yourself. Keep chair legs on the ground. We understand that everyone makes mistakes and sometimes poor choices are made. If this should occur, consequences will be determined accordingly. Consequences may include, a warning, loss of paws applause, time deducted from recess, and a note or phone call home. I understand the classroom management plan that the third grade will be using this year. Is my study place available to me whenever I need it? Is my study place free from interruptions? Is my study place free from distractions? Does my study place contain all the study materials I need? Does my study space contain a large enough desk or table? Does my study place have a comfortable chair? Does my study space have enough light? Make note cards for vocabulary words. You can write the vocabulary word on one side of the card and the definition on the other side. Or write a question from a study guide on one side and the answer on the other. 1) Rapid Fire: Quiz yourself with a stack of note cards that you have made. Make a pile of cards you do know and place cards you do not know at the back of the stack in your hand. This way, you are only studying the information you really don’t know. Be sure to study all the note cards again the night before the test. 2) Memory: Make a pile of note cards with a “Q” on one side. Also, make a pile of note cards with an “A” on one side. Then, for each question or vocabulary word on your study guide, write the question or vocabulary word on the back of the “Q” card and the answer or definition to that question on the back of a “A” note card. Then, you can make “matches.” The game at this point runs like Memory. Each player gets a turn to make a match. If the player makes a match, they get another turn. If the player does not make a match, then the next player gets a turn. 3) Jeopardy: Make cards that have values if $100-$500 on them. Then, on the back of each card, write a question from your study guide. The difficulty of each question should match the value of money on the other side. If a team chooses $100 question and answers it correctly, they keep their $100 to add onto their total. Each team should take turns picking a card and the answer keeper should read the question aloud to that team. Have an answer keeper who can tell you if you answered the question correctly and who can total up points at the end. Below are some useful websites that we’ve found to be helpful to any third grade student that is looking for a challenge or for help practicing a skill.